Tropical Storm Danny provided another good swell for the Cape Hatteras area last month with 5 days of great waves. This swell wasn’t nearly as big as Hurricane Bill, but for beach breaks like Cape Hatteras that can’t handle the size, this is actually a good thing! We had a cool trade-in board show up on the rack just before the swell – a mint condition 80’s Canyon 7’4” x 20.5” x 2.75”, so we thought it would be fun to add it to the quiver and see where surfboards were 25 years ago! This board showed up a few weeks ago, a trade for a 10’4 JL Ultimate Noserider. I didn’t see the trade go down, but I’m guessing the board was purchased new, used a few times, then garaged in a dark, shady corner with absolutely no exposure to UV light. There was no yellowing at all and the gloss resin was in great shape. Top and bottom logos were vintage neon fades, and I guess the glassers were so stoked that day, that they put two deck logos on the board, a purple to pink fade and a green to yellow fade. The board has a wide point forward, beaked nose and is thick to the rails, nose all the way to 2/3’s back with a pretty flat entry rocker. Neon green glass on fins rounded out the package making this board fit right in with all the 80’s throwback board shorts that are out there right now! I got to surf this board three different days during the TS Danny swell, in three really different types of conditions. The first day was well overhead and breaking on the third bar. A lot of water moving and a lot of open water paddling. The added length of the board, combined with the weight and thickness forward made this a paddling machine. Where shorter boards just seemed to be paddling in place, or even in circles with the current, this board made the difference of paddling and making ground. The next day was pure junk, but I had the day off so hit it anyway. It was waist to shoulder high breaking on the inside bar (the swell had dropped) with a side-onshore wind making for some pretty choppy faces. The positives of the session were that the Canyon handled the down the beach current well, and also mowed through chop on the face without losing speed. It didn’t turn on a dime or hit a tight section like you’d want it to, but it sure did turn a choppy, bumpy day into a fun session. The lack of rocker helped on connecting some flat sections but also provided some unbelievably funny to watch (not feel) wipeouts on late drops! The added weight dampened the chop just like all the rumors out there and the extra length and volume made paddling against the stiff current a lot easier. This day, the board felt more like a downsized longboard than a shortboard of any type, not really fitting into the tight sections of the wave but giving a stable, fast paddling platform to get as many waves as possible and riding them for longer than you normally would expect. With the waves smaller and broken up with more bowled sections and chop, the longer flatter board didn’t seem to fit into the sections as well, but the length, wide point forward and weight just plowed through it all anyway! I surfed with Jason Slezak this day and he rode a Stretch 6’ What. This board fit into the wave really well where the Canyon wouldn’t and it looked like the board was really working for him. Just like th Canyon, The What has a wider nose and flatter entry rocker, but is SHORT, so it fit into the wave, meaning no hang ups and more speed. The third day of the swell here in Cape Hatteras (Saturday) ended up being the best. The size picked back up (the buoys were reading 8ft at 10 seconds) and also the wind turned dead offshore for most of the day. We headed south and scored some great waves near The Lighthouse. The set up and the waves were so perfect I could have surfed a board a foot shorter, but this was the perfect day I was looking for to complete the “Canyon Trilogy” – big and clean! One of my good surfing friends said during the choppy session the day before, “Wait till you get that board on a big clean face…, then you’ll really get to see how it goes!” Was he right! On this day, Slezak surfed his Rawson 6’2 Impala. 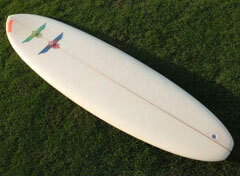 Wide point forward, thick to the nose, drawn out pintail set up as a tri fin. These two boards had the width and thickness forward to carry some nice paddling momentum into the wave. “Paddle machines” are sure nice to have on a bigger day like this. At over a foot shorter, the Rawson Impala sure had the edge in maneuverability. Slezy got some great waves…. We surfed for 6 hours that day and it ended up being one of the best days of the year. We poured ourselves into the truck at sunset and drove home, totally spent. What’s the conclusion from all of this? For one, it’s fun trying new boards and figuring them out. To me, I’d be just as stoked to surf a 5’10 fish as a 12’ SUP gun. I like the learning curve, as much as the top level of each. I also like to pick the best aspects of each board and try and add them to my overall impression of new boards or what can be done with future shapes. This board is probably over 20 years old, yet it taught me a lot of things why some modern boards work so well and why others don’t. The wider, thicker forward section of the board made catching waves a lot easier but drew out your turns more. The length and weight was a positive thing during choppy days and helped keep your momentum paddling, on the face and even during duck dives. The confidence of this board during a larger drop came from the length and stability of the shape, along with the momentum, once you were up and going, it just drew a line. Not the loosest line, but one that didn’t buck you either. It was a cool find on the used rack and a trip down memory lane for a memorable swell here in Cape Hatteras!